Unichem applied this printed laminate to a fabricated metal substrate for a client. Photo courtesy of Unichem. When using adhesives to apply laminates to flat rolled metal coils, complex problems can arise. Some OEMs are overcoming these problems by working directly with custom adhesive formulators that have expertise in coil processing. 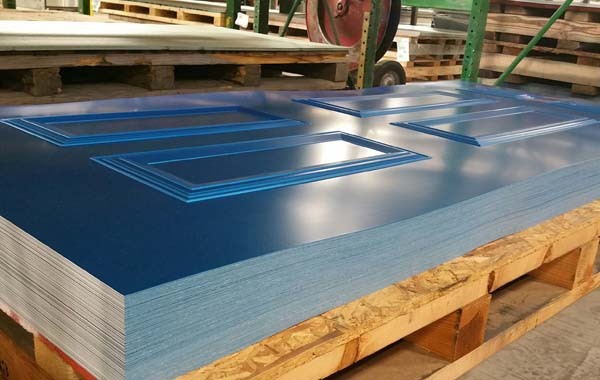 For manufacturers that utilize flat-rolled steel, aluminum, and other metals to fabricate parts or products, the ability to bond decorative foils and laminate films to the substrate provides an opportunity to deliver attractive finishes for a competitive edge. However, the process of laminating to metals is fraught with potential complications. If the wrong adhesive is utilized, if the curing process is not precisely controlled, or if a variety of other variables are not managed, the result can be a high scrap rate or parts that fail in the field. When this occurs, OEMs–and even the coil processors that supply them with bare or B-stage (pre-applied adhesive) coil–often turn to custom formulators for unique solutions to production issues. In many cases, the proper adhesive formulation can have significant benefits, such as speeding production, eliminating scrap, reducing the amount of material required, and even improving corrosion, UV, and antimicrobial resistance. The use of laminated flat-rolled metal to fabricate parts or products is widespread throughout manufacturing. Some of the more common applications include appliances (refrigerators and freezers, washing machines, dishwashers, microwaves, range or fume hoods), construction products (insulated wall panels, garage doors, roofing products), and the mobile and manufactured home markets (walls and door panels). The process of adhering laminates to coiled rolls or sheets occurs in several different ways. Manufacturers can employ in-house personnel to spray or brush adhesives within the plant. However, this process is slow, requires manual labor, and brings up safety and environmental concerns. Quality can also be an issue, and scrap rates are frequently quite high. 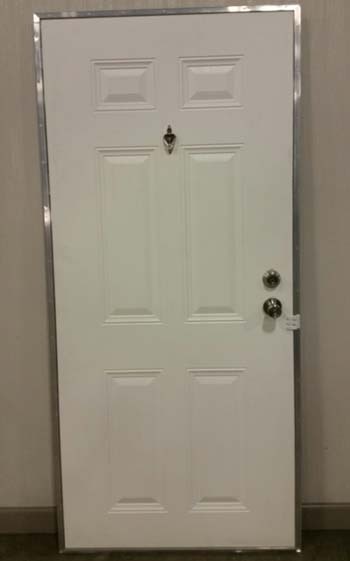 Elixir Door orders coil-rolled steel with pre-applied B-stage adhesive. A vinyl is then applied using curing ovens and nip rollers at the manufacturing plant. Photo courtesy of Unichem. Automated equipment can also be used to apply foils and films to flat-rolled metals that come with pre-applied B-stage adhesive from a coil processor. This type of adhesive is designed to activate and cure within a specific temperature range. The laminate is then applied to the coil at the manufacturer's plant using furnaces and nip rollers. Although automated processing is much faster and more efficient, it can also lead to quality control issues due to temperature variances within the curing ovens involved. In some cases, scrap rates can be as high as 20 percent. "Application of adhesives in the final manufacturing facility can lead to significant amounts of scrap, higher per piece labor costs, and can expose the manufacturer to significant environmental costs and scrutiny," said Eric Fossen, managing director of Spencer Ridge Consulting, of Ontario, Canada. "So they often are looking for a more efficient solution that gives them a more consistent [laminate] performance." Fossen, who serves as a consultant to the coil processing industry, said the simplest solution for OEMs is often to outsource the process completely. This eliminates the need for in-house labor, application equipment, curing ovens, and environmental control facilities. According to Fossen, many adhesive manufacturers offer a variety of off-the-shelf options, but will not customize a product to meet a customer's unique requirements unless very large volumes are involved. "With large adhesive suppliers, if they have a product that works–great. If not, they are often not willing to tweak the product to make it work for a specific application," said Fossen. 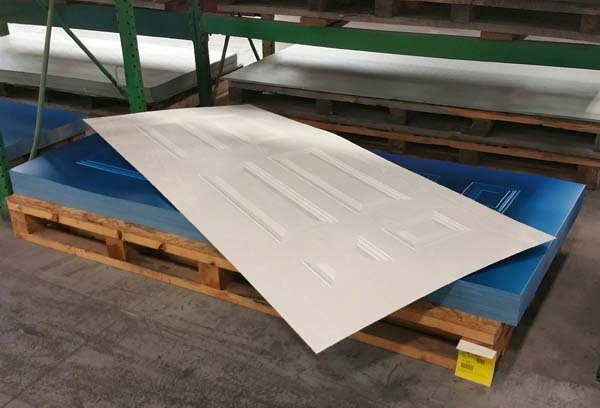 When Elixir Door began experiencing adhesion problems and a high scrap rate, the company turned to custom adhesives and coating formulator Unichem to solve the problem. Photo courtesy of Unichem. When this occurs, coil processors and even OEMs turn to custom adhesive formulators with the expertise and experience in coil processing to come up with unique solutions to difficult problems. Approximately two or three years ago, however, the Douglas, Georgia-based company began to experience significant adhesion problems, leading to a high scrap rate. "The vinyl was coming off in major proportions–not just a 'spot here' or a 'spot there,' but in many places. It was very inconsistent," explained Elixir Door General Manager Archie Brown. Unable to identify the reason, Brown said he called in a custom adhesives and coating formulator, Universal Chemicals & Coatings Inc. (Unichem), of Elgin, Illinois. The company specializes in coil processing and can create custom adhesives and also coatings. The solution involved an adjustment to the temperature parameters of the curing oven, as well as a custom-formulated adhesive from Unichem that was designed to cure within a broader temperature range. "Unichem analyzed our entire process and came up with some corrective actions," said Brown. "We adjusted everything and have had no problems since." According to Brown, Elixir Door subsequently decided to outsource the entire process. Now the coil processor delivers a finished, vinyl-coated part using Unichem's adhesive formulation that is already sized and stamped into shape. "We were paying [the coil processor] to apply adhesive, then paying to apply the vinyl in house. Now they do it all in one operation at their facility," said Brown. "So our cost is much less and we don't have to worry about scrap because it's on them, not us anymore." Unichem has also developed a B-stage adhesive used for bonding metal plates to PVC (polyvinyl chloride) membranes. The plates are fastened to the roof deck and, later, heat activated to bond to the membrane, creating a permanent and highly water-resistant roof. To create the ideal adhesive, Unichem had to meet a large number of physical performance criteria, such as resistance to exterior exposure, fast activation cycle, and high initial and aged bond strength. Unichem (www.unicheminc.com) was able to not only create a white adhesive, but also expanded the curing temperature range as well. "Unichem is unique in being able to take a set of performance criteria and formulate an adhesive to meet the requirements," said Fossen. Jeff Elliott is a Torrance, Calif.-based technical writer. He has researched and written about industrial technologies and issues for more than 20 years.